Then he bikes to the United We Can depot on Industrial Avenue. “It’s a heavy load, around 150 pounds. It’s like doubling somebody all the way,” he says. On one trip to the yacht club in the summer, he figures he might recycle 2,500 bottles and cans. "When I finally realized I was making a difference, that made a difference to me. I can see a little glimmer of light and I can thank the Binner’s Project for that." Welcome to the life of a self-employed recycler. It’s tough work. Leland, a team leader with the Binners’ Project, knows this well. He’s been a “binner” for 14 years. Now in his 60s, Leland works eight to 10 hours a day, six or seven days a week in the summer. In winter he’s able to get that down to five. “I’ve never found a way to get under a five-day week,” he says with a smile. Binners endure 52 weeks a year of uncertain work in all kinds of weather. Often treated as outcasts, most lead solitary lives as they push shopping carts or tow bike trailers across the city. 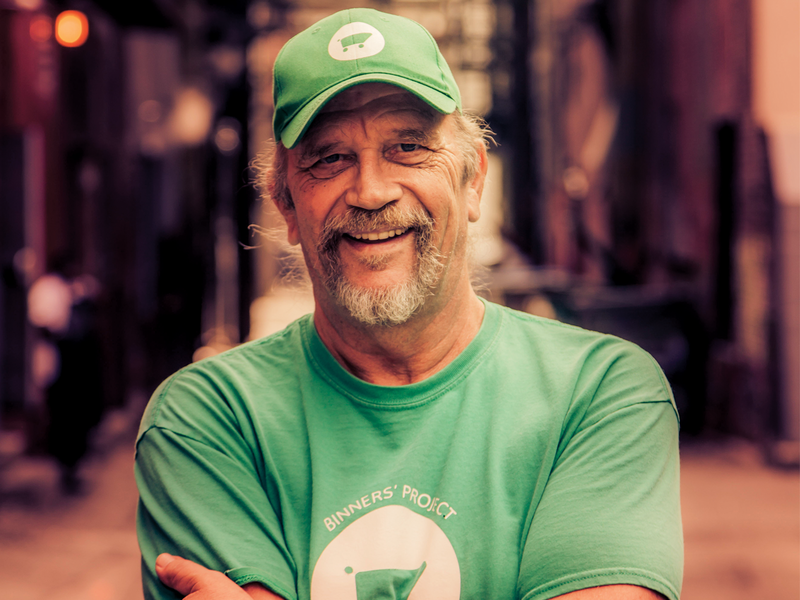 The Binners’ Project was started in 2014 by Ken Lyotier, the founder and former Executive Director of United We Can, to improve the lives of independent recyclers on multiple fronts. It is now run by Executive Director Anna Godefroy, who volunteered with Ken since the inception. The Binners’ Project engages about 300 urban recyclers annually in workshops, meetings, and events like the Coffee Cup Revolution, in which recyclers pick up coffee cups all over the Lower Mainland for a five-cent refund. The project has three main goals: to decrease the stigma associated with binning; to boost economic opportunities for inner-city recyclers; and to create social networks, both between the recyclers themselves and with organizations already in place in the Downtown Eastside. About this last goal, Godefroy notes that there are many services in the DTES that marginalized people don’t know about and don’t use. Taking Leland’s Monday yacht club pick-ups alone, a reasonable estimate would be 100,000 recyclables saved from the landfill each year. Multiply that by metro Vancouver’s hundreds of binners working five days a week, and the environmental impact starts to become clear. United We Can’s single location on Industrial Avenue recycles close to 22 million bottles and cans a year, most collected by binners. His work with the project has expanded beyond his own recycling. As team leader he helps oversee cleanups at big events, and he acts as an outreach liaison to the binner community, inviting new members to attend meetings and get involved. At some events—like this year’s PNE—he and other members help educate attendees on separating garbage from recycling.